What is an attorney fee structure? An attorney fee structure is a method of deferring income and taxation on the current year's earned fees, while at the same time guaranteeing future income for retirement, children's education, or other anticipated needs. Is the personal injury client required to structure a portion of his or her settlement before attorney fee can be structured? No, the claimant can take cash, and the attorney fee can still be structured on a stand-alone basis. What are the tax advantages of structuring my attorney fee? The two tax advantages when considering an attorney fee structure are (1) - the deferment of current earned income and the tax on that income and (2) - the deferment of taxation on the interest earnings prior to distribution. Why structure my attorney fee in a fixed interest rate annuity? Most financial advisers suggest that every portfolio should have a portion of the investment allocated to fixed income. A properly designed Attorney Fee Structure can represent that fixed portion of a balanced portfolio. Must I structure my entire fee? Do my partners also have to structure their fees? 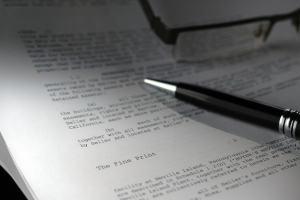 An attorney may structure all or a portion of the fee earned on a given case. It is not necessary for your partners to structure their fees as well. Can I receive the same type of stream of guaranteed payments as the personal injury client? Yes, you can choose to receive a stream of payments over your lifetime, a defined period of time, in one future lump sum payment or a series of lump sum payments. Choosing a structure provides you the flexibility of selecting immediate or deferred payments. Are there any limitations to the amount of fees an attorney can defer? If the attorney participates in a qualified retirement plan or an individual retirement account (IRA), he or she may still defer additional income through an attorney fee structure. Unlike traditional retirement plans, there is no requirement of annual distribution. What is the legal basis for structuring attorney fees? The U.S/ Court of Appeals for the 11th Circuit affirmed in Richard A. Child's, Et al. V. Commissioner of the Internal Revenue Service. The Tax Court ruled that attorneys may structure their fees, and taxes are payable on structured attorney fees when the amounts are received. See Child's V. Commissioner, 103 T.C. 36, aff'd 89 F.3d 856 (11th Cir. 1996). What do I need to do to prepare for structuring my attorney fees? Your contingency fee agreement should include a provision that gives you the option to elect to receive your fees in the form of future periodic payments. Additionally, to avoid taxation resulting from a transfer of the fees from the firm to an individual attorney, the firms Deferred Compensation Agreement should be amended for the specific case. You should negotiate the inclusion of the fee structure when settling the case. The creation of a tax-deferred fee structure does require the cooperation of the defendant, similar to when the personal injury victim's settlement is structured. Attorney Joe Smith, Age 40, expects to receive a $400,000 contingent fee on a recent case. Joe decided to include a provision in his fee agreement with his client that would allow him to receive a portion of his fee in the form of future periodic payments. 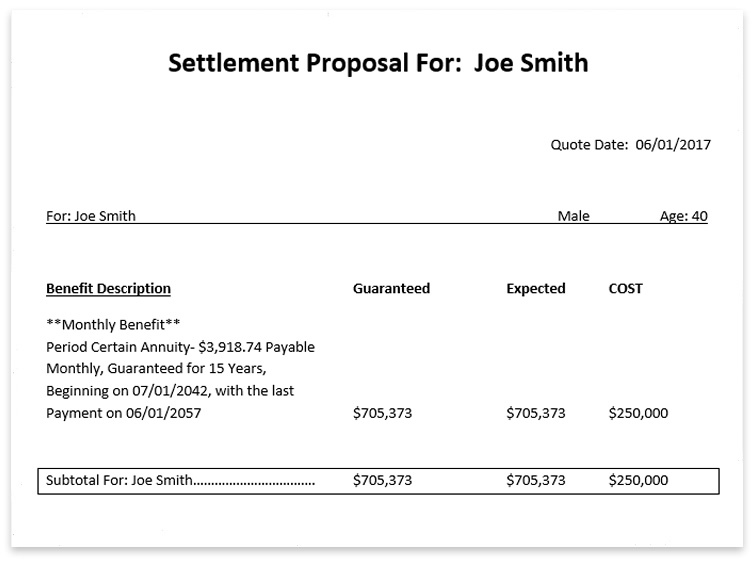 During the settlement of the case, Joe inserted the periodic payment language into the Settlement Agreement and Release. He elected to defer $250,000 for a twenty five year period and take monthly payments over a fifteen year period beginning at age 65. As you can see in the example quote, Joe's monthly payment of $3,918.74 will begin on 06/01/2042 with the last payment on 06/01/2057. This will yield an overall guaranteed amount of $705,373.00. An attorney who considers deferral of his/her contingent fees through a structured settlement should consider modifying the fee agreement with the client to include the following language. This action helps establish the ability establish the liability of the client to make periodic payments consistent with the facts in Child v. Commissioner (103. T.C. No. 36, Nov. 14 1994).